Anderson spent six seasons as an assistant coach with the Arcadia University women’s soccer program. 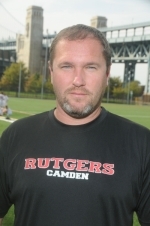 Anderson brings plenty of soccer experience and NJAC familiarity to Rutgers-Camden. After playing four years of scholastic soccer – his first two at Willingboro High School and his last two at Lenape – he played collegiate soccer at one of the NJAC’s powerhouse programs, Richard Stockton College. A center back and marking back with the Ospreys, Anderson played two seasons for Stockton before injuries and his work schedule forced him out of the collegiate game. Anderson graduated from Stockton in 1998 as a Public Health major, with a concentration in Health Care Administration. He was offered a professional contract with the Eastern Shore Sharks of the USISL, but turned it down and started coaching and training soccer players in South Jersey in 1999. His Highland team, which was known as both the Lightning and the Fusion during his tenure, was a four-time state semifinalist and a two-time state finalist. He also coached the Pennsylvania-based FC Bucks squad to the state finals and regional quarterfinals. Anderson joined the Arcadia University women’s program in 2003 as an assistant under new Head Coach Rick Brownell. He helped the Knights qualify for their conference tournament every season, first in the Pennsylvania Athletic Conference and later in the Middle Atlantic States Collegiate Athletic Corporation, also known as the Middle Atlantic Conference. Arcadia won the PAC title and earned an NCAA berth in 2005. The Knights lost in overtime in the 2007 MASCAC Freedom Conference title game. Anderson has been a personal trainer for numerous State ODP (Olympic Development Program) players, several regional ODP players and a pair of national ODP players. His former players have played at all divisions of NCAA soccer, including one who has won a pair of national titles at the University of North Carolina. Anderson’s staff at Rutgers-Camden will include returning assistant coach Byron Carmichael and newcomer Joe Banks. Anderson is a sixth-grade teacher at the Ulysses S. Wiggins Elementary School in Camden. He and his wife Jennifer have been married for 14 years and have two sons, Ryan, age 11, and Aaron, age 8. 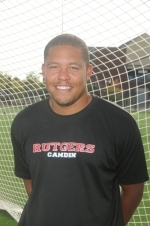 One of the all-time great scholastic soccer players in South Jersey history and a member of the Marshall University Athletics Hall of Fame, Byron Carmichael returns for his sixth season as an assistant coach with the Scarlet Raptors. The all-time leading scorer for the Ocean City franchise of the Premier Development League, Carmichael retired after the 2011 campaign, his eighth season with the team. Carmichael finished the 2011 season with five goals for 10 points, including two goals in his final game, a 4-0 victory over the Brooklyn Knights on July 24, in which he was named Man of the Match. During his career with the Ocean City Barons/Nor’easters, Carmichael collected team records of 62 goals, 24 assists and 148 points while also setting program records with 102 games and 7,885 minutes played. During the 2010 season, Ocean City changed its name from the Barons to the Nor’easters, but Carmichael’s production remained the same. He led his team in scoring for the fourth consecutive season that summer, collecting five goals and five assists for 15 points, on the way to earning his fourth consecutive honor as the team’s Offensive MVP. Carmichael led the Ocean City Barons in 2009 by notching a career-high 11 goals and adding one assist for 23 points. He was named the Player of the Round for the first round of the Lamar Hunt U.S. Open Cup after he scored two goals to help the Barons upset the USL Second Division’s Crystal Palace Baltimore in a battle between amateur and pro teams. That performance hiked Carmichael’s career total to 10 career goals in U.S. Open Cup matches, tying him for third place on the all-time list since professional teams joined the tournament in 1995. It also sparked the team on a run to the Third Round of the U.S. Open Cup – including a 1-0 overtime win against the Real Maryland Monarchs – before eventually losing to MLS power D.C. United, 2-0. Carmichael was named the Barons’ Offensive Player of the Year for the third straight season after helping his team to its most successful season ever, capped by a berth in the PDL’s Elite Eight. Along the way, he scored the third hat trick in program history, notching three goals in a 5-1 win over the Newark Ironbound Express (July 2, 2009). Carmichael’s first year with the Barons was in 2004, when they were known as the South Jersey Barons. During his storied career he was a member of the 2006 PDL Eastern Conference Team of the Year, notched his hat trick against the Ironbound Express and set the team’s single-game record with three assists against the Westchester Flames (May 14, 2005). He also tied for the team mark with a three-game assist streak (July 18-22, 2007). During his three-year scholastic soccer career at Rancocas Valley High School, Carmichael earned All-South Jersey First Team honors each season. He was named the South Jersey Player of the Year by every major newspaper during his senior season in 1998. Carmichael followed his standout scholastic career by becoming the all-time leading scorer at Marshall University (1999-2002). He led the Thundering Herd in scoring each season on his way to setting the program and the Mid-American Conference records with 58 goals and 128 points. He holds the top three single-season marks for goals at Marshall (18 in 2000 and 15 apiece in 2001 and 2002) and the top three point totals (41 in 2000, 33 in 2001 and 32 in 2002). He also finished his illustrious Herd career with 12 assists, ranking among the program’s Top 10 in that category as well. A three-time member of the All-MAC First Team (2000, 2001 and 2002), Carmichael also was named the MAC Player of the Year in both 2000 and 2002. During his freshman season in 1999 he captured MAC Newcomer of the Year honors. Carmichael earned a berth on the All-Great Lakes Region Second Team in 2000 and 2001. He was the Most Valuable Player of both the Nike Gold Rush Classic and the FIU Tournament in 2001, and has been inducted into the Black Legends of Marshall University. He was inducted into Marshall’s Hall of Fame in August, 2008. Carmichael, who graduated from Marshall University in 2003 with a degree in Management Information Systems, was selected 60th in the 2003 Major League Soccer Supplemental Draft by the Kansas City Wizards. He has played professionally with the Wilmington Hammerheads of the USL Pro Select League, as well as the PDL’s Ocean City franchise. With the Hammerheads, he had another great moment during the U.S. Open Cup play, collecting a pair of assists in a 4-1 upset over Major League Soccer’s Dallas Burn in 2003.